Hyderabad : The current batch of 2016 – 18 at IMT Hyderabad has quite a reason to cheer in this New Year. More than 75% the students have been already placed with highest CTC of 12 lacs per annum (LPA), top 20 offers average CTC being INR 11 LPA; top 50 being INR 8.8 LPA; and top 100 average CTC being INR 7.56 LPA. Some of the top recruiters were Amazon, Kantar, Deloitte, FactSet, ICICI Bank, Bluestar, CBRE, FactSet, NephroPlus, HDFC Bank, along with a host of new recruiters such as Verity Knowledge Solutions, TresVista Financial Services, Novartis, Kaara Infosystems, TVS Motors, Walmart etc. “The mood is relaxed, the trend is encouraging and we are not in a hurry to wrap up the placement session. We are looking forward to the remaining placement season with optimism and confident of going past the highest offer of 22.5 LPA offered last year”, said Prof. Satish Ailawadi, Director at IMT Hyderabad. Institute of Management Technology (IMT), Hyderabad engages with corporates through several initiatives. Business leaders and senior corporate professionals play an integral part in course development and deliver 15% sessions in regular courses to familiarize the students with the real time business scenario. 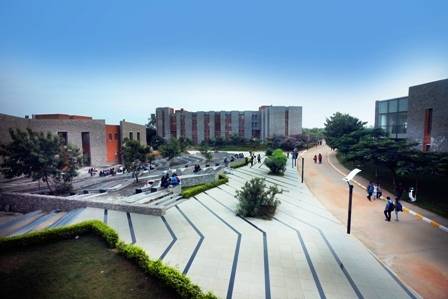 According to Prof. Dhananjay Singh, Chairperson Admissions and faculty in marketing at IMT Hyderabad, “Initiatives like the leadership series, mentor-mentee program; deliberations with subject matter experts from the corporate, on hot topics are held yearlong to be in touch with the corporate world. The institute also brings together corporate executives engaging them in various initiatives beyond structured classroom setup like the ‘Ace Connect’ – where Cricket, Football, Volleyball, and Basketball matches are held in the 30 acre campus where corporate participates in groups. The Industry centric approach has paid us well. The continuous engagements with members of the corporate world provide the students’ with tremendous learning opportunity”. IMT Hyderabad offers PGDM program in Marketing, Finance, Human Resource Management, Business Analytics and Information Technology, Operations Management, General Management and has tie ups with 22 Global Universities in 17 countries for student and faculty exchange programs. The online application window which was closed on November 24th, 2017 has now been opened for the phase 2 application process.